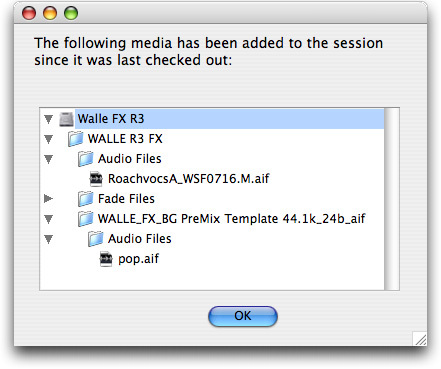 Sometimes Pro Tools media gets scattered across many locations. Audio and fade files get placed on drives you didn't expect. Or you bring in media from a drive and leave it referenced to the original drive when you should have copied it. 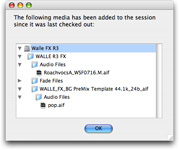 Session Hub rustles those errant files and makes sure that the next time you or someone else wants to use a session, the necessary media files don't go missing. "You're getting ready to bring your cut dialogue session to the dialogue premix stage. You've copied all the media for the session to a firewire drive. There are a few last minute changes you make to the session, then you pack it up and go over to the stage. You open up the session on the stage and – uh oh –there are missing media files. How did that happen? That's when you remember that you did a few time compressions in those last minute changes and forgot to copy them to the drive. Now you have to frantically find someone back at the edit bay who can find the right files (hopefully they are in the Audio Files folder). Then the assistant has to figure out the best way to send over the files to the stage. Are they too big to email? Do you both have FTP access? Is Digidelivery installed?" Using Session Hub, you get immediate access to all the audio and data you need, without ever having to worry about it.